Marvel Comics has announced a new X-Men title launching in April that spotlights the female members of the team. Yes, finally, a book dedicated to some of the many X-Women who have won fan hearts for years! The X-Women who have dominated the franchise since the Chris Claremont days! 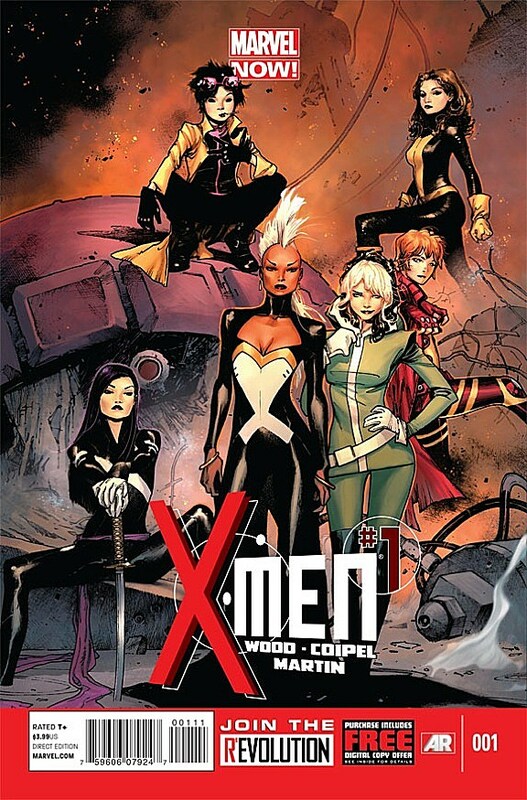 Obviously, then, this book celebrating X-Women is called X-Men.The gender-confused name doesn't bother writer Brian Wood, who told USA Today, "I feel like as far as the X-Men go, the women are the X-Men. Cyclops and Wolverine are big names, but taken as a whole, the women kind of rule the franchise. If you look at the entire world as a whole, it's the females that really dominate and are the most interesting and cool to look at. When you have a great artist drawing them, they look so amazing and always have." The great artist in this case is Olivier Coipel, whose amazing cover for the first issue reveals the line-up for the book's opening arc: Storm, Rogue, Kitty Pryde, Rachel Grey, Psylocke and Jubilee. Yes, Jubilee, most recently seen as a vampire as a result of Marvel's failed attempt to cross superheroics and the Twilight demographic in "Curse of The Mutants" and related storylines; not only is she a surprise addition to the team, she also happens to be the book's central character (Wood admits, though, "I don't want to make it the 'Jubilee and friends book.' They're all A-list characters - I've got to make them all shine"). Wood says that he's taking inspiration for the new series from two classic X-Men runs: Chris Claremont's mammoth run from the 1970s through the 1990s and Grant Morrison's New X-Men series from the early 2000s. That latter run, Wood says, is his "personal template for how you do what I'm doing now," as well as the starting point for another character in the book: Sublime, the sentient bacteria that caused such trouble for Xavier and the team during Morrison's issues. "If I can make the reader feel the way I felt about [Morrison's run], where you're just like, 'Ah, this is just right, this is the X-Men,'" Wood said, "that's the kind of vibe I'm going for." X-Men #1 is released in April.